So you have bed bugs. You definitely feel frustrated and grossed out, and you might also feel ashamed. After all, you may have gotten the impression that the only people you get bed bugs are those who do not keep their homes clean. In reality, bed bugs happen, whether you keep your home pristine or live in squalor. In fact, there are many different ways you can get bed bugs, and it doesn’t matter if you vacuum your carpets and wash your bed sheets daily—when a bed bug gets into your home, it will stay as long as possible. This might make it seem like bed bugs are inevitable, but in fact, you can prevent bed bugs. In order to enter a home, bed bugs need to attach themselves onto a someone or something. This means that if you take extra precautions about who and what is allowed in your home, you have a great chance of avoiding bedbugs. In order to help with this endeavor, we have made a list of the most common sources of bed bugs. Perhaps it is not surprising that hotels are among the top three most common places to find bed bugs. With so many people coming in and out of hotels, there are plenty of opportunities for them to enter a hotel, as well as plenty of hosts to feed on. All it takes is one female bedbug to enter a hotel and she will lay up to five eggs every day until the whole place is brimming with bed bugs. Once they have entered a property, bed bugs spread rapidly, from room to room through pipes and vacuum cleaners. From there, they can also hop into your luggage and come home with you. Traveling is by far and away the most common cause of bed bugs in the home, so if you are traveling soon, make sure to choose accommodations carefully. Have you ever seen a beautiful couch on the street with a “FREE” sign on it that caught your eye immediately? Hopefully, you resisted the urge to call your friend with a pickup truck and haul it into your home. An incredibly common cause of bedbug infestation is discarded furniture. People don’t tend to advertise that their used furniture is bed bug-ridden, or they may be unaware of infestation, but particularly if your area is suffering from a bed bug epidemic, avoid used furniture for this reason. Even if you buy new furniture, be sure to take caution, as bed bugs may have been present on a piece of furniture previously shipped in the truck. Unfortunately, even if you are doing everything right, you can still contract bed bugs if your neighbors have an infestation. It is pretty common for bed bugs to migrate from one housing situation to another, particularly if you live in an apartment or condo. Bed bugs can crawl more than 100 feet in one night, and often travel through tiny cracks, vents, and even in between floorboards. All it takes is one female bed bug to get into your home for your neighbor’s infestation to become your own. Just like used furniture, used clothing can present a problem with bedbugs. Clothing is another way bed bugs can enter your home, so it is important to be diligent about cleaning any used clothing before it enters your house. Use hot water to wash it; bed bugs cannot survive in temperatures over 122 degrees. Beyond clothes, make sure to do the same for used toys, bedsheets, and any other washable item that enters your home. Sadly, bed bugs don’t need fabric in order to travel. 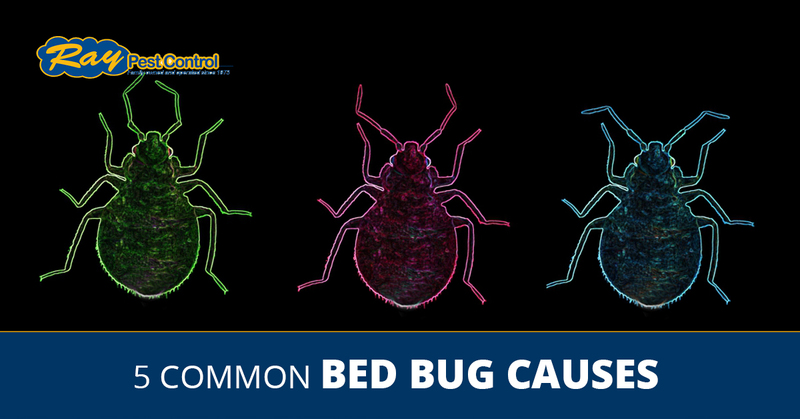 Beyond bedding, clothing, and stuffed animals, bed bugs can also come into your home via books and used applianced. Pretty much anything that allows a bed bug to hide in a dark crevice is fair game. Again, but very careful about what you bring into your home, double checking to ensure it hasn’t been infested. Regardless of how bed bugs entered your home, when you need bed bug treatment in Winston-Salem, Ray Pest Control can help. Contact us today and we can come help you with bed bugs!